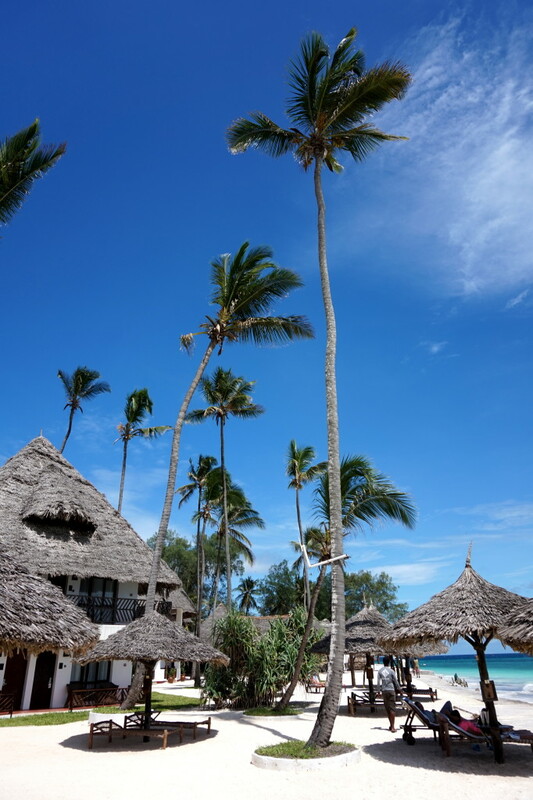 Nungwi was the second stop on my Zanzibar trip and I really wanted to see some of the famous beaches there. Nungwi is located approximately 50 km north from Stone Town and as I mentioned before, it’s easy to arrange transport as long as you don’t pay anyone (apart from your hotel) in advance. When I arrived to my hotel, or I should rather say resort – the Doubletree by Hilton Nungwi, I was immediately greeted by the staff with a glass of juice and a freshly baked warm chocolate chip cookie. Yum! The resort wasn’t full due to it being the low season so I was allowed to enter my room long before check-in which was quite nice. Luckily I was assigned to a ground floor room with an ocean view, so the moment I stepped out of my door I could see the beach. It was the ideal combination of luxury and relaxation. 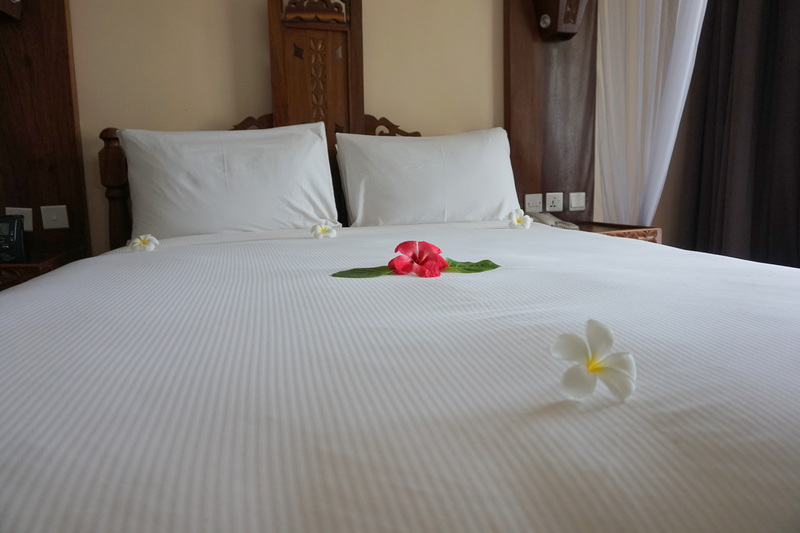 The room came with lots of Tanzanian ornaments and a huge comfy bed that was covered with rose petals twice a day by the housekeeper. Just take a look at my second part of the video. However, the beach wasn’t quite what I expected it to be, like those in the Cook Islands or Fiji. Nungwi beach was small, with quite a lot of vendors and not that many people. It looked like the majority of people chose to rest on their sun loungers instead of lying on the beach, making the scene look quite nice. The water was absolutely amazing, clear enough for me to see many fish swimming around. Beach appeared as I walked away from the resort. As I was a full-board guest at Doubletree by Hilton Nungwi, I didn’t have to walk around the village to find food, although that wouldn’t have been a problem anyway. There are more than enough beach restaurants around and finding a fresh seafood dinner is never a problem, even during the low-season. Food at my hotel was great. 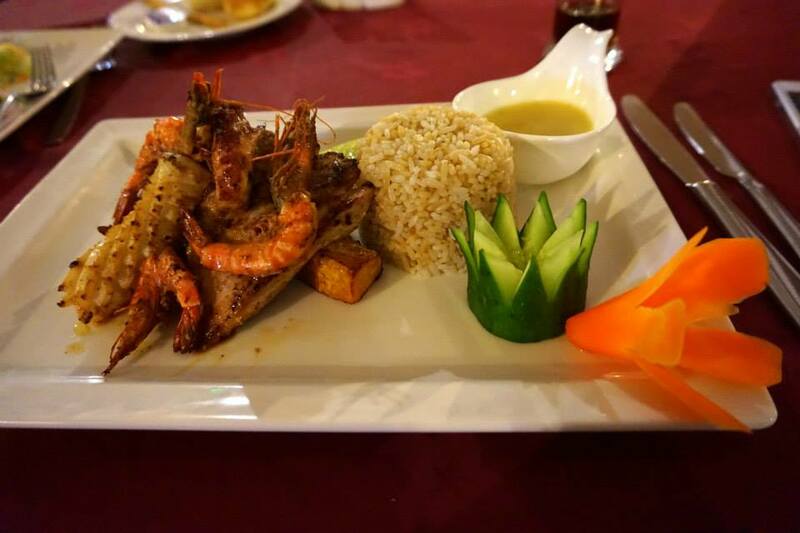 Every day’s menu had a different theme – African, Asian, Seafood, etc and you could choose what you wanted from an a la carte menu. I was told that during the high season the hotel also offers buffet meals. I particularly liked my seafood main course of calamari, shrimp and mussels with rice and a salad with tartar sauce. It might sound strange to eat a salad with tartar sauce, but I loved it! Every all-inclusive Doubletree resort also has a pool bar. I have to say I was impressed by the variety of cocktails they had available and I also met some funny people and had a relaxing time at the pool. Despite having a shuttle scheduled for the day of my departure, nobody showed up or answered my calls. However, when the staff found out about my situation, they offered to drive me without any extra charge and they even gave me another warm cookie for the road. It was incredibly nice and sweet of them! I definitely recommend Doubletree by Hilton Nungwi to anyone planning a relaxing holiday in Zanzibar! Book your stay in Nungwi here! 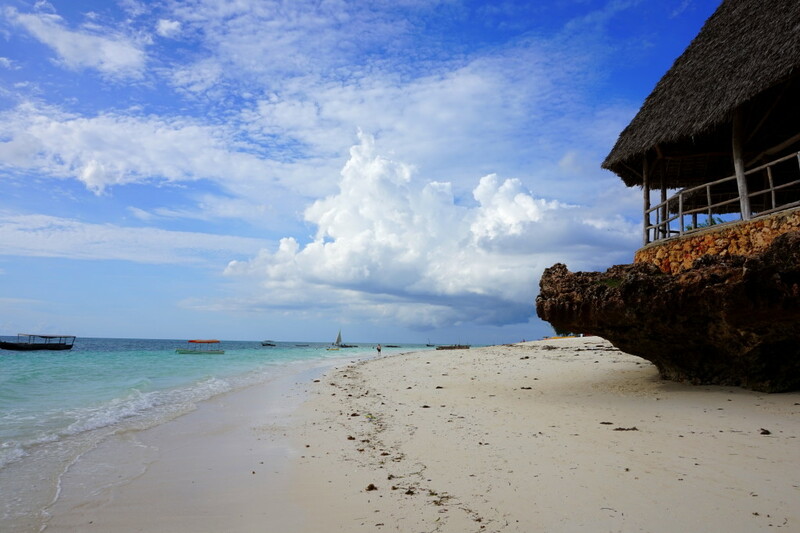 Will remember about this place if I visit Zanzibar. Thanks! Turtles are the best. Similar seen in Oman. Really in Oman? That’s interesting! ok, so the beach might not be the best one but still the place look stunning! no wonder you enjoyed it there! However small, I must admit that the beach is quite amazing with clear water to have seen those fish as they enjoyed their swimming. That will be the first beach I will visit once I get to Africa. Looks fantastic! I am thinking of visiting Africa for the first time. Would you rather recommend Tanzania or Uganda? BTW, if you stay at any Doubletree.. you get a chocolate chip cookie.. its their thing. Love that chain. Have you ever flown Ethiopian? How did you get from Dar es Salaam to Zanzibar? Yes, I have. It’s not great, but you’ll be fine. I flew Kenya Airways to Zanzibar. These beaches look amazing! 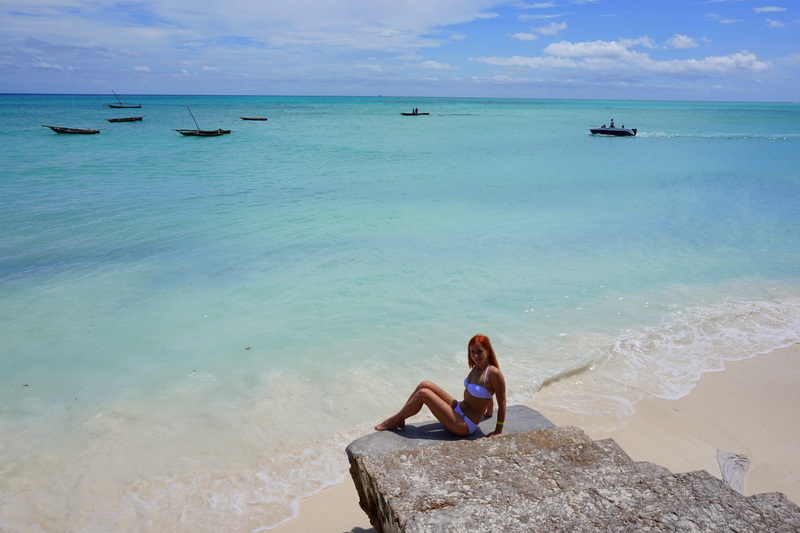 I’m definitely adding them to my Zanzibar trip in March!